From Goodreads ~ If you are the kind of mom who shapes your kiddo’s organic quinoa into reproductions of the Mona Lisa, do not read this book. If you stayed up past midnight to create posters for your PTO presidential campaign, do not read this book. If you look down your nose at parents who have Domino’s pizza on speed dial, do not read this book. But if you are the kind of parent who accidentally goes ballistic on your rugrats every morning because they won’t put their shoes on and then you feel super guilty about it all day so you take them to McDonald’s for a special treat but really it’s because you opened up your freezer and panicked because you forgot to buy more frozen pizzas, then absolutely read this book. 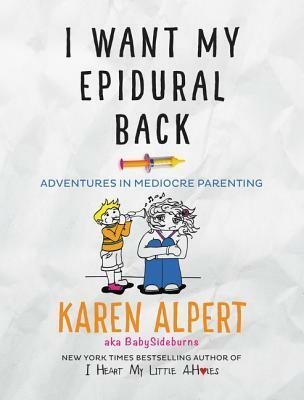 "I Want My Epidural Back" is a celebration of mediocre parents and how awesome they are and how their kids love them just as much as children with perfect parents. 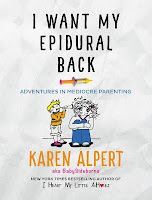 Karen Alpert’s honest but hilarious observations, stories, quips and pictures will have you nodding your head and peeing in your pants. Or on the toilet if you’re smart and read it there. I'm a childfree (by choice) and I haven't spent a lot of time around children (I've never ever changed a diaper ... and I'm okay with that). So I'm not sure why I picked up this book as it's about parenting ... but I'm glad I did as I found it hilarious. 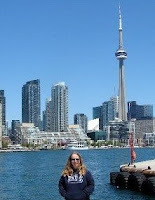 Awwww sh!t, whatta you mean they grow up?